Hadley Panzer of Lakin continues undefeated season at 285. The Rocky Welton Invitational is one of the state’s best wrestling tournaments and featured all four of Kansas’ nationally ranked wrestlers, along with Hoxie’s Dayton Porsch, a three-time state titlist, and Scott City’s Wyatt Hayes, ranked first in 4A at 170. Rocky Welton, the major Fredonia girls’ tournament and the annual Western Kansas Tournament of Champions (Mid-Continent League/Northwest Kansas) League tournament headlined the state this week. Goddard, which captured the acclaimed Newton tournament two weeks ago, continued to establish themselves as Kansas’ best team. The Lions, ranked first in Class 5A, won the 42-squad Welton tournament with 220 points. Pueblo East (Colo.) was second at 206. Kearney (Neb.) took third at 176.5. Garden City-Brown was fourth at 141.5. Other Kansas teams included Great Bend at sixth with 116.5 points. Blue Valley Southwest took seventh at 110, Dodge City eighth with 105.5 and Newton tenth with 95.5. Scott City, ranked first in 4A, was No. 11 with 95 points. Hoxie, ranked fourth in 3-2-1A, was No. 14 at 76 points, and Colby, which has been first in 3-2-1A, was No. 17 with 63.5 points. Hoxie senior Dayton Porsch had one loss in his entire career entering the finals against Goddard’s Trevor Dopps, ranked first in 5A at 160. Porsch, a Division I University of Northern Iowa signee, was 28-0 this winter after 36-1, 33-0 and 35-0 his last three seasons. Dopps defeated Porsch, 5-3, in sudden victory in an outstanding match. Dopps (28-7) had a bye and then had victories by fall in 3 minutes, 2 seconds, 9-1 and 6-3. Porsch stayed first in 3-2-1A. As well, Troy Fisher, a Northwestern University signee and ranked nationally at 170 pounds and No. 1 in 5A, moved to 16-3 with a title. Fisher held off Scott City’s Hayes, 7-2. Fisher won his first three matches in 32 seconds, 1:18, 2:00 and 7-3 before the title. At 182, Cayden Atkins (26-9) won the title and is ranked second in 5A. He had a bye and had three straight falls with 47 seconds, 2:58 and 2:57, the latter versus Holcomb’s Tanner Johnson (24-1). Johnson was undefeated and ranked second in 3-2-1A. In the finals, Atkins captured a 5-1 victory against Brady Badwound of Air Academy (Colo.). At 152, Nolan Craine (32-6) captured a title and is ranked third in 5A. In the semifinals, he pinned Great Bend’s Alex Randolph in 4:37. He earned a 6-2 victory in the championship against Eagle Crest (Colo.)’s Tyler Maccagnan. At 126, freshman Jerrdon Fisher, who has vaulted up the 5A rankings, took third and continues to stay No. 1 in 5A. His only defeat was a 2-1 loss in the semifinals. At 145, Cayleb Atkins finish fourth with his only two losses versus Great Bend’s Gage Fritz. In the quarterfinals, Fritz won 3-2. In the third place match, Fritz captured a 5-3 victory. The rankings stayed the same – Fritz third and Atkins fifth. In a stacked weight class at 220, Trenton Willert (28-10) took fifth. He remained fourth in 5A. Newton’s Wyatt Hendrickson, St. James’ Cade Lautt and El Dorado’s Braden Morgan are all ranked nationally. In the semifinals, Lautt narrowly defeated Morgan, 4-3. In the finals, Hendrickson defeated Lautt, 9-3. Hendrickson is 28-0 and Lautt moved to 42-2. Morgan, a sophomore who is 18-2, easily captured his third place match with a technical fall victory. He remained first in 4A. Other than the matchups against each other, the trio won all its other matches by fall or tech fall. Hendrickson was arguably the tournament’s best wrestler for all classes with wins by fall in 1:19, 25 seconds and 1:09. Hendrickson and Lautt remained 1-2, respectively, in 5A. The Buffs, this week’s American Implement Team of the Week, had its Brown and White squad. The Brown squad consisted of the top wrestlers. Brown had three runner-up showings with 113-pounder Silas Pineda, junior 132-pounder Jacob Holt and junior 195-pounder Alex Rodriguez. Pineda is second in the classification, Holt first and Rodriguez sixth. Junior 120-pounder Diago Hernandez and junior 285-pounder Refugio Chairez each earned fifth. Hernandez moved from sixth to third. Chairez remained second. Josh Janas came into the rankings at sixth in 138 after his big run. He was seeded No. 23 and took fifth. Janas lost his first match by fall in 4:56. Then, he ran off five straight victories by fall, technical fall, a 7-0 decision, an injury default and a fall in a minute. After a loss, he defeated Goddard sophomore Jace Fisher, ranked third in 5A, in a 7-5 decision. Lakin’s Hadley Panzer had a great run through the 285-pound bracket and moved to 26-0. In the quarterfinals, he defeated Chairez, 3-2, in the ultimate tiebreaker. In the semifinals, Panzer won by fall against Valley Center’s Tony Caldwell by fall in 5:05. Caldwell is 26-4, and Chairez is 16-5. In the championship, Panzer defeated Dodge City’s Evan Darville in sudden victory, 7-5. Darville is ranked No. 1 in 6A, and Panzer stayed second in 3-2-1A. Lakin, one of the smallest schools at the competition, had just three wrestlers. However, the other two competed well. At 138, Kade Lovelady (15-11) went 3-2. At 170, Kayden Christiansen (21-7) finished 1-2 with a first-round victory by fall. The Panthers continued to assert themselves among the upper echelon in Class 5A. In addition to Gage Fritz and Alex Randolph’s third-place finishes, George Weber took third at 138 and suffered his first loss of the season, but remained perfect versus Kansas wrestlers. Weber twice defeated Scott City’s Kaden Wren, who has been ranked first or second in 4A at 138 this year and is currently second. In the quarterfinals, Weber won in sudden victory, 6-4. In the third place match, Weber earned a 5-1 victory. Weber is 35-1, and Wren stands at 22-3. In the semifinals, Weber lost, 13-1, to Aaden Valdez of Pueblo East (Colo.). Weber bumped a spot to second in 5A. Fritz stands 35-2 and Randolph is 29-5. At 106 pounds, Wyatt Weber (25-10) finished fourth. He lost in the third-place match to Dodge City’s Damian Mendez, 9-3. Mendez is 33-6. Hoxie doesn’t have the depth of other 3-2-1A schools but has plenty of elite talent. In addition to Porsch, Drew Bell (23-5) took seventh at 120 pounds. In the seventh place match, he won by fall in 2:16 against Dodge City’s Couy Weil, who has been ranked in 6A throughout the season and is currently fourth. Bell stayed second in 3-2-1A. At 132, Dylan Weimer (23-5) was fifth and continued a great season. Even last week, Weimer was unranked in 3-2-1A. He went 4-2, including key front-side victories by 4-3 and 2-1 margins. This week, he moved into the poll at No. 6. At 145, Aidan Baalman (24-8) finished in seventh. Baalman also came into the rankings at No. 6. Before the rare loss, Porsch had victories by fall in 50 seconds, 3:02, 3:42 and an 8-1 decision. Colby, which has remained first in the 3-2-1A rankings the majority of the year, has excellent depth, especially compared to other 3-2-1A squads. The Eagles finished with multiple top-11 showings, led by a pair of sixth-place finishes from Kory Finley (25-9) at 182, and Hagan Booi (25-6) at 195. Finley is third and Booi is second. BVSW is ranked fourth in 5A behind Goddard, Arkansas City and Maize. BVSW enjoyed a second-place finish from Hayden Mills (27-6) at 106 pounds. He had a bye, then captured wins by 9-1, 7-2 and 9-5 margins before the 8-4 loss against Kearney (Neb. )’s Archer Heelan in the championship. He is ranked second in 5A. At 113, Brett Umentum (30-9) finished fifth and went 5-2 with both losses to out-of-state wrestlers. At 126, Joseph Dennison (28-6) took fifth and went 4-2, also with losses only to non-Kansas competitors. He continued to be fourth in 5A. At 138, Brandon Madden (30-4) enjoyed a runner-up finish and stayed first in the classification. In the semifinals, he defeated Goddard’s Jace Fisher, 10-0. In the finals, he fell to Pueblo East’s Valdez, 11-0. At 170, Seth Nitzel (30-7) was fifth. Acclaimed McPherson senior Mya Kretzer, one of the nation’s top girls, earned top wrestler honors at the Fredonia Invitational – for boys or girls. The boys’ tournament featured several top-ranked wrestlers, including Campus’ Kale McCracken, ranked No. 1 in 6A at 113, and Winfield’s Owen Braungardt, who is first in 4A at 182. Winfield is ranked second in 4A, and Campus is sixth in 6A. In the championship match at 126 pounds, Kretzer defeated Andover Central’s Anja Tschohl by fall in 3 minutes, 57 seconds. Kretzer is 7-0 against girls this season and has wrestled boys the majority of the year. She had a bye and then won by fall in 52 seconds, 1:20 and 3:57. In the girls’ 106 class, Burlington’s M.J. Huff won over McPherson’s Riley Baker by fall in 3:34. Huff, a freshman, is 15-3. Baker, a sophomore, dropped to 7-11. At 113, Independence’s Alexis Allen beat Fort Scott’s Jenna Graham by fall in 54 seconds. At 120, McPherson junior Kaleigh Marbut won by fall against Burlington sophomore Matti Huff by fall in 4:50. Marbut is 17-2 and is tied with Haley Schafer (17-1) for the Bullpup girls’ lead in victories. Marbut went 4-0 and captured her four victories by falls in 24 seconds, 1:57, 56 seconds and 4:20. Among McPherson girls, Marbut has a team-high 16 falls and also leads with 24 takedowns, according to team statistics. Schafer paces the Bullpup girls with reversals (six), 3-point near falls (five) and total near falls (eight). Scott Radke leads McPherson with 29 victories and is ranked second in 5A. At 132, Burlingame sophomore Gianna Culbert, who is also another nationally ranked wrestler, moved to 16-0. She won her matches by fall in 3:20, 50 seconds, 46 seconds, 58 seconds and 1:38. Schafer collected the title at 138 with a win by fall in 1:22 against Douglass’ senior Devon Cokeley (13-5). She also captured her first two wins by fall in 1:05 and a 14-3 major decision. At 145, Erie junior Kat Rounds has enjoyed a strong season with a 20-4 season. Rounds had wins by fall in 2:31, 3:27, a 14-1 major decision, a 7-6 decision and a forfeit victory. At 152, McPherson’s Holli Giddings (12-6) won the title, with Douglass’ Jewella Cokeley second. Giddings was 3-0 with wins by fall in 5:01, 1:10 and 2:51. At 160, LaCygne-Prairie View sophomore Copenhagen Browning improved to 15-1 with victories by fall in 55 seconds, 42 seconds, 29 seconds, 1:53 and 2:14. At 170, Burlington’s Bryleigh Isch won the title, and McPherson’s Madison Skytte captured the title at 182. Nickerson’s Harley Kuntz won at 220. A week after winning the Bob Kuhn Senior Prairie Classic in Hays, Campus easily captured the boys’ side of the Fredonia tournament, a competition that had 21 scoring teams. Campus had 264 points, followed by Winfield at 163 and Fredonia at 152.5. Kale McCracken (29-0) won the title at 113 pounds and stayed No. 1 in 6A. He had a quality win in the finals against Winfield’s Braden Ledford, 9-0. Ledford is ranked second in 4A. At 138, Nathan Bowen (29-4) won in the final versus Perry-Lecompton’s Thad Metcalfe by fall in 3:06. At 152, Luke Bowen (32-3) took first with a 7-3 decision against Southeast-Cherokee wrestler Durbie McReynolds. Both Bowens stayed third in their respective weight classes in 6A. At 195, Brycen Schroeder (24-4) captured the title with a 13-6 victory against Rossville’s Kody Davoren. He is fifth in the rankings. At 285, Jacob Beehler (24-10) won the title by fall in 4:54 versus Perry-Lecompton’s Collin Rossillon. Braungardt (25-3) earned the title at 182 and stayed first in 4A. He collected his three victories by fall in 1:12, 1:26 and 2:36. At 132, Drake Hill (16-12) won the title with victories in 12 seconds, 13-8 and 4:56. Steele Morin also earned a title at 160 and moved to 17-8 with a 10-3 victory against Nickerson’s Dylan Stewart. Morin is ranked fourth in 4A, up a spot from last week. Rossville junior Zach Archer, ranked No. 2 in 3-2-1A, took the 106-pound championship with a fall in 1:23 against Jake Stanton’s Caney Valley. Rossville’s Alex Archer won at 120 in a mild upset. Alex (19-4) defeated Fredonia’s Hunter Reddick, 11-9. Last week, Reddick was No. 4 in 3-2-1A. Now, Alex is fourth and Reddick is fifth. At 126, Layne Hurla (23-7) captured the title against Campus’ Taylor Parrett by fall in 5:46. At 145, Matt Weilert, who has bounced between 138 and 145 this season, earned the title with a fall in 3:50 against Anderson County’s Lane Freeman. Weilert improved to 21-5. He is ranked second at 145 in 3-2-1A last week. At 170, Fredonia’s Buddy Claibourn improved to 19-2 and defeated West Elk’s Conery Noll, 7-1, in the title. At 220, Burlingame sophomore Dane Whalen improved to 18-2 and defeated Campus’ Garin Williams, 8-3. Williams is 22-6. The MCL and NWKL have long dominated the 3-2-1A state wrestling meet, especially with Norton, Smith Center, and Hoxie in recent years, along with strong finishes from Phillipsburg, Plainville, Ellis, Oakley and Oberlin. This year, the WKSTOC tournament was very close with Smith Center winning with 148 points. SC edged Plainville by three points and host Norton by 5.5 points. Phillipsburg was fourth at 119 and Hill City fifth at 112 in the 12-team meet. The meet was full of ranked 3-2-1A wrestlers. Smith Center had 25 pins to lead the tournament, which was two more than Norton and five in front of Hill City. For SC, 113-pounder Colton Shoemaker (24-4) earned the title with three victories by fall in 2:54, 29 seconds and 47 seconds. He remained second in the classification. Jaden Atwood, which moved into the top ranking last week, won the 138-pound title and improved to 27-7. Atwood went 5-0 with five falls in 1:35, 4:29, 28 seconds, 16 seconds and 1:42. As well, Andrew Wilkenson had the biggest seed/place difference of any wrestler when he took third and finished plus-5. He lost his first match at 120 and then captured his next three matches to take third. Brandon Rohr (25-4) won at 145, including a win by fall in 5:31 over Smith Center’s Jacob Kirchhoff. Rohr moved up a spot from sixth to fifth in the rankings. Jordan Finnesy (27-2) won at 170 in dominant fashion with victories by fall in 1:18, 3:18, 1:07 and by injury default in 19 seconds. Ryan Junkermeier (22-5) took first at 195 with a 4-0 mark and also won all four by fall in 1:08, 1:14, 3:15 and 5:29. They remain second and third in their classes. Plainville led in collective seed-place difference at plus-7. Kobe Spiess was seeded tenth and took seventh with two victories. He is 3-9 this year. The Bluejays’ 106-pounder Darius Shields (22-8) captured the title with two falls, a 13-0 major decision and a 9-2 win against Plainville’s Logan Normandin. 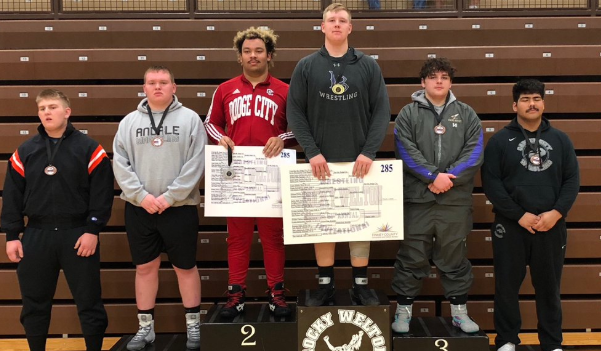 At 220, Hayden Wiltfong, who announced his commitment to Fort Hays football this week, captured the title with another dominant tournament. Wiltfong has lost just once this year and had falls in :51, :51, 1:45 and :49 seconds. He stayed No. 2. At 160, Brandon Vacura (21-4) went 5-0 with all victories by fall in 1:06, 2:39, 40 seconds, 1:52 and 1:46. He is fifth at 160. Last week, the 126-pound rankings featured Norton junior Camdyn Untersher at No. 1, Hill City senior Alec Segarra at No. 3 and Phillipsburg’s Jacob Sisson at No. 5. However, Segarra won the title, while Sisson finished second and Unterseher was third. In the first, Segarra defeated Sisson, 6-3. Segarra is 23-4, and Sisson is 23-5. In the semifinals, Sisson beat Unterseher, 8-4. Unterseher is 18-4. This week, Oberlin senior Drew Juenemann is first, while Segarra is second, Sisson fourth and Unterseher is fifth. St. Francis’ Garin Cooper won the title at 120 pounds in an upset against Phillipsburg’s Aaron Lenker, 5-2. Lenker was ranked fifth at 120 last week. Cooper into sixth in the poll. At 132, Phillipsburg’s Austin Niblock scored a slight upset with a 9-7 victory in the finals against St. Francis’ Tiernan Poling, who was ranked sixth in 3-2-1A last week. At 152, Wichita County’s Jesse Gardner, ranked fifth in 3-2-1A, defeated Plainville’s Ben Hansen for the title in a 4-2 decision. Gardner is 17-1. Hansen (21-9) came into the rankings at No. 6. As well, Wichita County’s Jesse Hermosillo won the title at 285 with a win by fall in 20 seconds. Hermosillo is 15-4. At 182, St. Francis’ Shadyron Blanka earned the title with a 6-4 decision and improved to 18-6. Beloit won the 12-team Hoisington meet with 171 points, well ahead of runner-up Hoisington at 137 points. Cimarron took third at 119.5 points, and Douglass was fourth at 100.5. At 132, Tate Kadel (20-4) won the title and went 5-0 with four wins by fall and 9-5 decision in the championship. At 152, Zane Colson, who co-ops with Beloit but wrestles for Mankato-Rock Hills, moved to 21-0 and stayed No 1. He won all five of his matches by fall, including 4:44 in the championship, easily his longest match. Hoisington junior Wyatt Pedigo, ranked No. 1 in the classification, faced off with Douglass’ Zach Dressler, who is ranked fifth. Pedigo (28-1) won by fall in 3:49. Overall, Pedigo captured his other four matches by fall in 16 seconds, 3:43, 13 seconds and 1:52. At 170, Joshua Ball (27-5) captured the title with four falls, including one in 3:26 in the championship, and a major decision. On the girls’ side, Jessi Kindscher (8-5) won the title at 120 pounds. She won by a 6-1 decision, a fall in 2:37 and a fall in :49 seconds. Ell-Saline senior Nick Davenport, who is ranked No. 1 at 220 pounds, moved to 27-0 and captured the championship. He went 5-0. In the second round, he matched up with Marion’s Charlie Nordquist, who is ranked third, and won 11-5. In the finals, he defeated Stafford’s Laithen Shocklee by fall in 5 minutes. Shocklee (21-5) is part of a Stafford team that has thus far exceeded expectations with many wrestlers in their first year of competing. Shocklee was seeded third and took second, and Cayden Brozek was seeded fifth and finished fourth at 113 pounds. At 106, Goodland freshman D. J. Knox (27-7) was ranked fifth in 3-2-1A and went 5-0 with all wins by fall. Arkansas City captured the 18-team SEK Invitational with 282.5 points, well ahead of second place Mill Valley (178) and third place Chanute (166.5). For AC, Jevin Foust (28-10) captured the title at 106 pounds. In the finals, he earned a 10-2 victory against Chanute’s Trent Clements (26-5). Foust is No. 1 in 5A, and Clements is fourth in 4A. At 132, Gabe Buckbee (18-3) captured the title at 132 over Chanute’s Logan McDonald in an 11-4 decision. Buckbee is second in 5A, and McDonald is 25-6 and ranked fourth in 4A. At 152, Montez Robinson (33-5) had a dominant run with four victories by fall, including 35 seconds in the final against Mill Valley’s Brodie Scott. He remained No. 1 in 5A. At 285, Terrell Morris (17-8) won the title with a 5-2 victory against Topeka Seaman’s Jared Kerr. Chanute’s Kolton Misener (26-7) captured the championship at 113 pounds with an 8-1 victory in the title against Shawnee Heights’ Freddy Maisberger (21-4). Chanute is third in 4A. Frontenac’s Riley McDaniel (25-0) stayed undefeated and won the title with a 2-1 tiebreaker finals victory against Arkansas City’s Trig Tennant. He is ranked first in 4A.